Cold Formula is an herbal tea that temporarily relieves coughs due to colds. Recommended dose: Drink one cup every 3 hours, not to exceed 8 cups in 24 hours. Directions for use: Pour 240 mL freshly boiled water over 1 tea bag and steep, covered, for 10 to 15 minutes. Gently squeeze the tea bag to release the remaining extract. Add honey to enhance benefits, especially in dry climates. Medicinal ingredients: Each tea bag (1.7g) contains: Organic peppermint leaf (Mentha x piperita) 460 mg, organic cinnamon bark (Cinnamomum spp.) 187 mg, safflower flower (Carthamus tinctorius) 153 mg, organic ginger rhizome (Zingiber officinale) 119 mg, organic hyssop herb (Hyssopus officinalis) 119 mg, coltsfoot leaf (Tussilago farfara) 119 mg, organic European elder flower (Sambucus nigra) 68 mg.
Non-medicinal ingredients: Organic sweet orange peel (Citrus sinensis), organic clove flower bud (Syzygium aromaticum), organic rose hip (Rosa canina). Cautions: Do not use this herbal tea for asthma or emphysema or if cough persists for more than one week. Consult a health care practitioner if you have gallstones, gallbladder or bile-duct obstruction, hiatal hernia, or acid reflux. Contraindications: Do not use if you are pregnant or breastfeeding. Do not use if you have an allergy to Asteraceae/Compositae/Daisy family. 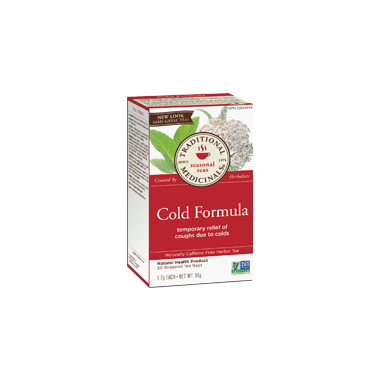 Traditional Medicinals Cold Formula was quite effective for me during my last cold. I found that it helped to relieve that constant feeling of needing to cough that I get in my chest. My chest was actually getting sore from coughing so much and so deeply, but drinking this made my chest and throat feel soothed and warm. I also thought it tasted pretty decent, so that was a bonus. I will definitely use this again! Although nothing can instantly cure a cold, this tea makes my symptoms so much easier to bear! I have used this tea for over 10 years. Every time I feel a cold coming on, I drink 2 or 3 cups of this tea over a 6 hour period. I have not had a cold in 10 years! I have to send it to my sisters in Spain and UK as they both feel the same way and cannot get it there. Love this brand, all their teas are fantastic. Really helps with both dry and productive cough. Tastes good and helps me get through the day. It really works! Makes me feel better, clears head and chest. I carry some bags to work, and share with friends. Taste is quite pleasant and refreshing.